Freshwater turtles are fun but demanding pets. Compared to sedentary or shy reptiles like some snakes and lizards, aquatic turtles are engaging and entertaining captives. Providing and maintaining an appropriate habitat for turtles can be challenging, but it's the most important aspect of caring for them. However, it's important to understand the cost associated with the habitat and care of turtles will greatly exceed the cost of the turtles themselves. 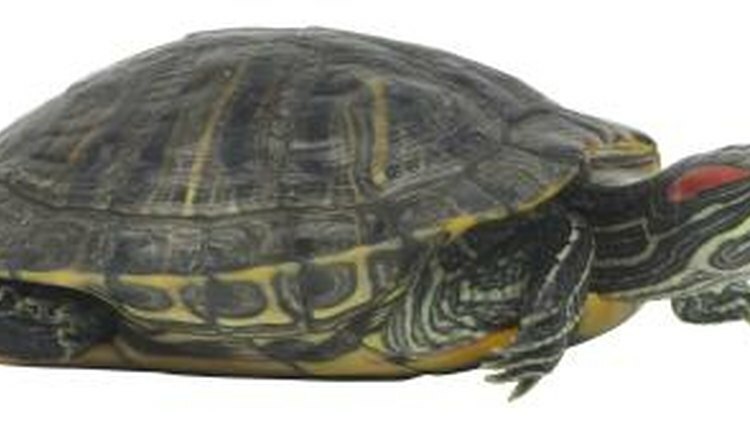 Commonly kept species like red-eared sliders (Trachemys scripta) and painted turtles (Chrysemys picta), should be maintained in large aquariums. As a general rule, a 100-gallon tank is appropriate for adult sliders and similarly sized turtles. It's fine to house two or three similarly sized adults in this space. Plastic tubs, cattle troughs, kiddie swimming pools and aquariums can all be used for the enclosure. A screen-lid is needed for the top, which often must be custom built for tanks of this size. Depending on the temperature of the room where the aquarium is kept, it may be necessary to heat the water. Aquarium heaters are readily available at pet stores. The water should be kept between 75 and 80 degrees Fahrenheit; though adults are not likely to suffer from slightly cooler temperatures, it's important to provide warm water for young turtles. When heating a large aquarium, it makes more sense to buy a few small heaters rather than one large unit. Just as wild turtles are often seen sunbathing on rocks and logs, pet turtles require heat lamps so they can get out of the water and bask. Providing adequate basking temperatures is perhaps the most crucial component of turtle husbandry. Dome lamps with ordinary incandescent bulbs can be used to provide basking spots. Experiment with bulb wattage and the number of dome lamps to achieve a basking spot of approximately 90 degrees. Wild turtles have the sun. Your turtles require full spectrum lighting, including the UVB portion of the spectrum, placed over their basking spot to properly metabolize their calcium. A number of full-spectrum, UVB-producing bulbs are available commercially, but be careful about the type you select; some bulbs may be labeled "full-spectrum" but won't emit significant amounts of UVB. These bulbs are often expensive and must be replaced at six-month intervals as they stop producing UVB. Turtles eat lots of food and produce a lot of waste. Investing in quality filtration is the only viable, long-term solution, and even this will require periodic partial water changes. To prevent future headaches, select a model rated at three times the tank's capacity; a 100-gallon tank needs a filter rated at 300 gallons per hour. The filter will build up a population of beneficial bacteria, so complete water changes are not advised as it may kill off the colony. Despite this, biweekly 25 percent water changes are a good maintenance technique to maintain good water quality. Whenever adding water to the habitat, use a conditioner to ensure any chlorine or chloramine in your tap water is neutralized. Use a timer to control both the heat and full-spectrum lights. Set the timer to provide turtles with approximately 12 hours of daylight each day. Breeding turtles need you to mimic natural seasonal changes; breeding usually coincides with the longer days of spring. In all cases, the filter and water heater should run 24 hours a day. Gravel or aquarium sand can be used as a substrate in the habitat. Gravel should be large enough that the turtles cannot ingest the stones. Gravel should not be used with soft-shell turtles (Apalone sp.) as it may damage their shells. Some keepers don't use substrate so the habitat can be cleaned more effectively, but it doesn't look as nice. There are a few options for furnishing the habitat. Some keepers prefer a spartan cage, while others prefer a complex, natural-looking habitat. In all cases, the turtles will need a place to get out of the water and bask. This can be a simple platform, a stack of flat rocks or pieces of strategically placed driftwood. Be sure the turtles can easily crawl onto the platform.